With outside groups' ads, we are able to see exactly how much they are spending to air them (which gives an indication of seriousness, etc.). We have asked the Flake campaign for similar information. 1. (4) Sinema's ad focusing on veterans' issues. 1. (4) (NEW) Jeff Flake ad featuring Sens. McCain and Kyl bemoaning Richard Carmona's "lack of integrity" for airing archive video of same Senators praising Carmona when he had been nominated to be U.S. Surgeon General. 4. (3) Majority PAC slamming Flake as a walking uranium time bomb. 4. (3) (NEW) American Commitment running a positive ad for Flake. 4. (3) Now Or Never PAC's spot urging voters to not let Carmona in the door. 9. (2) NRCC's ad amplifying Sinema's "leeches" remark. 9. (2) The NRSC's ad calling Carmona a "rubber stamp"
9. (2) Kirkpatrick's ad with cowboys blasting "Lobbyist Paton"
9. (2) AFSCME attacking Flake's "extremism". 9. (2) The ad (that does not verbally announce its sponsor at the end) using Sinema's "Prada socialist" comment. One mention: DCCC on Parker, Carmona's McCain/Kyl ad, DSCC's new ad with a breast cancer survivor blasting Flake, Flake's "The Choice" spot, AFF's anti-Kirkpatrick spot, Club For Growth's "Wow" ad blasting Carmona, Penzone ad, Ava Arpaio spot. --Minutes ago, the American Future Fund filed that it has doubled its investment in the CD1 race, spending $500,000 (total is $1,002,675.22) to produce and air a new ad supporting GOP nominee Jonathan Paton. --The super Republican SuperPAC called the Congressional Leadership Fund threw down in a big way yesterday, plunking down $572,748.88 on producing and airing an ad slamming Democratic nominee Kyrsten Sinema (CD9) for her comments about stay-at-home women (complete with bleeps). (They even spent $25,000 on an additional web-only video. --The Democratic Senatorial Campaign Committee produced a new commercial on Monday, targeting Flake. They spent $50,889.09 on producing it, then $473,000 airing it, bringing their total to over $3.1 Million. --The DCCC put more moolah into its efforts against Jonathan Paton (CD1) and Vernon Parker (CD9). It spent $518,049.15 on its most recent ad against Paton (total to date is just shy of $2 Million). The DCCC also produced a new ad against Parker ($3,000) and spent $700,025.84 for media time to air it. Their total in that race is also over $1.9 Million. --The League of Conservation Voters spent $41,000 on phone calls oppoing Flake. Their total is nearing half-a-million. --The Ending Spending Action Fund put together a new ad supporting Flake, spending $18,000 on production and $250,000 on airing it. Their total is over half-a-million. --Women Vote!, which is a Democrat-philic effort of Emily's List, had been concentrating on mailers supporting Ann Kirkpatrick in CD1. Today, they branched out, spending $93,778.45 on a media buy (plus $6,186.33 on production) opposing Republican nominee Jonathan Paton in CD1. They also entered the CD9 race, producing and airing a spot opposing Vernon Parker in CD9 for $100,000. --The National Right to Life PAC spent about $8,690.69 on radio ads on the Premiere Radio Networks, supporting Flake, Paton, Parker, and Martha McSally (CD2). It is not clear whether there are separate spots for each, or just one for the GOP slate. Thanks to those readers who sent me their logs of the ads they have seen or heard. Mary P., James S., D.D., and two others have multiple entries in the gift card drawing. 1. (11 sightings) Majority PAC's ad slamming Senatorial nominee Rep. Jeff Flake's uranium mining support. 2. (10) The DSCC's spot attacking Flake on a variety of fronts. 3. (8) Now or Never SuperPAC's ad attacking Democratic Senatorial nominee Richard Carmona on a variety of fronts. 6. (6) No On 204, featuring State Treasurer Doug Ducey. 7. (4) Newcomer American Commitment's ad slamming Carmona. 7. (4) Kirkpatrick's spot with cowboys ripping "Lobbyist Paton"
9. (3) DCCC's oldie-but-goodiez(?) equating Vernon Parker (running for CD9) with the Tea Party. 9. (3) The Club For Growth's spot asking us how well we know Carmona. 9. (3) NRCC calls Kirkpatrick "shameful". 9. (3) NRSC's oldie-but-goodie(?) labeling Carmona as a "rubber stamp"
Democratic nominee Richard Carmona used the praise heaped on him by Arizona's Senators Kyl and John McCain when President Bush had nominated him for U.S. Surgeon General in an ad. Kyl and McCain - who both support GOP Rep. Jeff Flake (CD6) to be Kyl's replacement - were outraged and said Carmona had lost all credibility. Kyl shot back by saying that when he had recruited Carmona to run as a Republican for retiring Rep. Jim Kolbe's office, Carmona had been overly concerned about whether the job included a car and a house in D.C. Today, Carmona fired back, producing a praising letter from Kyl to Carmona earlier, when Kyl had apparently recruited Carmona to run for Governor against then-Gov-now-DHS-Secretary Janet Napolitano. DeConcini - through the Carmona operation and the Politico website - publicized the letter, and said that Kyl's comments to conserative blogs (which found their way quickly into Arizona media) were "a factual statement." The comment plays on Kyl's imbroglio last year when his spokesman said Kyl's erroneous comments about Planned Parenthood "were not intended to be a factual statement". The famous Gunfight at the O.K. Corral took place in Tombstone in 1881 and involved several participants on either side. Following the jumps are Carmona's initial ad, the Kyl-McCain responsive ad, and DeConcini's comments. --Freedomworks for America, a Tea Party organization that has been on the ground in AZ for Flake during the past several weeks is inches away from breaking the $1 Million barrier. It spent $76,548 for a mailer (copy needed) today, bringing its total to $982,911.24. --The NRA continues to give attention to Arizona's tight races, today spending more than $60,000 ($60,807.72) for online ads supporting Rep. Jeff Flake's Senatorial bid. --The League of Conservation Voters gave a major boost in its support to Richard Carmona, Democratic nominee in the Senatorial battle, funneling $105,000 to Terra Strategies - a consulting firm based in Iowa. This brings their pro-Carmona spending to more than $677,000. --SuperPAC American Commitment spent $100,000 today on TV and radio advertising to hammer Carmona. The Center for Responsive Politics lists them as focused on what it sees as President Obama's anti-coal policies. They have now spent $1.4 Million on this race. (On Saturday, American Commitment filed that it had spent $50,000 on social media advertising. --The NRCC (National Republican Congressional Committee) has put another $266,247.13 into media hammering former Rep. Ann Kirkpatrick in CD1. Their total outlay on this race is millimeters shy of $2.5 Million. --Senate Conservatives Fund spent another $25,571.03 to support Flake online. Their total is now about $143,000; it is the SuperPAC created by South Carolina Senator Jim DeMint. --Locally-grown SuperPAC Arizonans For Jobs spent $40,000 for phone-calling in favor of Flake. They have now spent more than $100,000 on the race. --Conservative superpower Club For Growth is spending big on online advertising for Flake, plunking down $152,747. They are now over $1.8 Million into this race. --The League of Conservation Voters made a $400,000 TV ad buy attacking Flake on his positions and background on uranium mining. --On Saturday, the NRCC filed its Friday expenditures on the three competitive Congressional races in Arizona: $114,295.75 (total, $537,444.75) opposing Rep. Ron Barber (CD8-running-for-CD2), $180,046.13 (total, $1.4 Million) opposing Kyrsten Sinema (CD9), and $565.008.29 (total, $2.2 Million) opposing Kirkpatrick. --National Rifle Association has been drawing a bead on Arizona lately. Today, they filed that they spent $5,000 ($5,080.45) on phone calls for Rep. Jeff Flake's Senate campaign. (First NRA expenditure for Flake.) They (actually, a different NRA entity) also sent out postcards to support Martha McSally (CD2) and Vernon Parker (CD9) - about $1,700 each. All three are Republicans. --Club For Growth dropped more than $300,000 to increase its TV advertising in favor of Flake and against Richard Carmona. That brings their Flake total to a staggering $1.65 million, and their close ties have been discussed here before. --The National Republican Senatorial Committee ("NRSC") put another $1.4 million into its advertising effort against Carmona. This brings their total on the race to $3.4 Million. --The NRSC's counterpart, the Democratic Senatoria Campaign Committee ("DSCC") plunked down another $100,000 on advertising, bringing its total in the race to nearly $2.6 Million. --Making their 1st appearance in Arizona, the Ending Spending Action Fund - which has been active in the presidential race - spent $250,000 in advertising time today (and another $13,000 producing the spot). They are opposing Carmona in the Senatorial race. ArizonasPolitics.com NEEDS your help to keep track of all of those nasty campaign postcards (etc) that keep flooding your mailbox! We also would like to know which of those 30-second ads you're seeing on TV or hearing on the radio. SOOOOO, to get your help, we are holding a drawing for a $20 Gift Card for iTunes or Amazon to get your help! 5 entries: Scan both sides (or, all pages) of the postcard/mailer. Black out your name/address, but leave the city/Zip. Save it in *.jpg, *.png, or *gif formats. E-mail it to info-at-arizonaspolitics-dot-com, with a subject line of "CAMPAIGN MAILER". Include your name (no last names will be used in the blog), e-mail address, and who you will vote for for President, U.S. Senate (Arizona), and Congress. 5 bonus entries: If you are the first to e-mail that postcard/mailer and it is used in the blog. 2 bonus entries: In the body of your e-mail, identify any portions of the mailer that you believe are false or misleading (and explain why). 3 entries: Keep a log of all political ads you see or hear during a 24 hour period. Necessary information should be in this order: (1) date/time/station (2) name of person/group responsible for ad (3) who/what the ad was for or against (4) any info that identifies the ad from all of the other nasties running. For 1 bonus entry, provide a link to where the ad can be found on YouTube (or, elsewhere). Can send ad log once per day. 1 entry: No purchase or e-mail with postcard or ad log is necessary to enter or win. Just e-mail your name, e-mail address and who you will vote for for President, U.S. Senate (Arizona), and Congress to info-at-arizonaspolitics-dot-com. Deadline to enter is 7:00pm (Arizona Time), Tuesday, November 6, 2012. Drawing will be held on Tuesday, November 13, and will be announced on ArizonasPolitics.com. Winner will also be notified by e-mail. Arizona'sPolitics.com reserves the right to disqualify any entry(ies) it deems to be inaccurate, or for any other reason. Thank you very much for helping improve our news coverage of the election. Last night, Arizona's Politics reported on the new mailers being sent out by Governor Jan Brewer's SuperPAC, "Jan PAC", supporting Jonathan Paton in CD1 and Martha McSally in CD2. Six weeks earlier, one of the nation's leading payday lending companies helped underwrite a Dallas fundraiser for Governor Brewer and her eponymously-named PAC. The fundraiser raised exactly $35,000.00; the mailer in the Paton/Kirkpatrick race cost $35,567.15. Former Rep. Ann Kirkpatrick and Democratic groups have spent mightily to pin former state Senator Paton with the nickname "Payday Paton", because of his previous lobbying for payday lenders and for a ballot proposition (Prop. 200 in 2008) that would have maintained legalization of payday lending (the laws were sunsetting). In the Jan PAC quarterly filing with the Federal Election Commission ("FEC"), the $2,500 contribution from "Cash America International" jumps out (page 8). Upon further inspection, it turns out that the lender - one of the top 5 payday lenders in the country - actually made an in-kind contribution, paying for food for the fundraiser (page 39). They, along with Ernst & Young, EuroCopter, and Texas State Senator (and big payday lending proponent and recipient of campaign contributions from the industry) John Carona, underwrote the September 7 fundraiser (at an expense of 9,073.75). The total of contributions raised from the Dallas area made on or about September 7 total to $35,000.00. Carona hosted the fundraiser along with billionaire Ross Perot, Jr. Governor Brewer had a public event the next day in Dallas. Cash America International obviously does not have any payday lending outlets in Arizona, but does have a number of "Cash America Super Pawn" and "Mr. Payroll Check Cashing" locations around the state. They spend heavily on political contributions and lobbying at both the federal and state levels, and include both Republicans and Democrats in their plans. Previous reporting on Jan PAC's contributions rightly focused on the enormous ($110,000) contribution from Copart, and upon contributions from other companies with possible business interests in supporting the Governor's funds. The September 7 Dallas fundraiser became more significant once Brewer decided to spend funds supporting Republican nominee Jonathan Paton (attacking Kirkpatrick); Paton's ties to payday lenders and the earlier campaign to prevent a ban of payday lending in Arizona have been repeatedly pushed by Democrats. There is no evidence that Cash America International's (or John Perona's) fundraising support from Jan PAC came with an understanding that Brewer would come to Paton's defense. However, it is noteworthy, especially since the amount raised is very close to the amount spent on the pro-Paton/anti-Kirkpatrick mailer. WATCH: Libertarian Presidential Candidate Gary Johnson: Don't Believe In Me, Waste Your Vote On Me! I am all for third party (or fourth party, or...) candidates, and I have no problem casting a vote for one if our views align, if he or she is serious and/or if he or she is the best person for the office. That has happened in the past. Indisputably, our two-party system has serious flaws in it. However, this is not the year for the third party candidate. Mike Stauffer has not made the case in his independent bid for Maricopa County Sheriff, Doug Quelland is not the answer in his state Senate race, and now Gary Johnson, Libertarian nominee for President, has shot himself in the foot. Arizona Governor Jan Brewer has used her SuperPAC to send out mailers supporting Republican Congressional candidate Martha McSally (CD2) and opposing Democratic candidate Ann Kirkpatrick (CD1). This comes less than two weeks after JanPAC made its first campaign independent expenditure against Kyrsten Sinema (CD9). Her filing with the Federal Election Commission ("FEC") late today indicates that she spent $35,567.15 on the mailer against Kirkpatrick and $29,651.01 for McSally. WATCH: Jeff Flake "Schools" Obama, Democrats; Celebrates 1st Grandchild, Hits On U.S. Regulations ""Locking Up Prime Mining Lands In Northern Arizona"
The Republicans chose Arizona Rep. Jeff Flake to deliver this week's national GOP Response to President Obama's weekly address, no doubt because he is locked in a key battle with Democratic nominee Richard Carmona. Flake used "now that school's back in session" as the theme for his attack on Obama and the Democrats. That gave him the opportunity to give a shout out to the just-born first grandchild for him and his wife, Cheryl, and to bemoan the amount of government debt already saddling the newborn Aidan Jeff Flake. However, perhaps most notable (especially juxtaposed next to the well-worn DSCC ad (below the jump) placing Rep. Flake's face on Arizona canyons), Flake cited the Adminstration's "regulatory overreaches" as a reason for our economic woes ("it is no wonder that the economy is struggling"). His number one example is that the Obama Administration is "locking up prime mining areas in Northern Arizona from responsible mining". That direct rebuttal of the DSCC's attack (and the DSCC ad) will be the subject of an upcoming Fact Check. In the meantime, congratulations to the Flakes on the birth of their first grandchild - although I doubt that the Congressman will spend much time with the baby (and he is too young to bring out on the trail) during the next two weeks. The National Republican Senatorial Committee ("NRSC") is apparently test-driving a new line of attack on Democratic nominee Richard Carmona. As the race continues to veer into the negative, the NRSC has posted on their YouTube channel a 49-second video slamming the former U.S. Surgeon General for votes he made in the late '90's/early 2000's when he was on the Arizona Board of Medical Examiners. Once Arizona's Politics is able to obtain (request has been made) and review the articles which the video relies upon, we will be better able to assess the validity of the allegations. Interestingly, as opposed to the accusations by Christine Beato, the Board allegations are being made by the NRSC and not Flake directly, and only on the internet rather than in the NRSC's currently-airing TV ads. I often appreciate the work that Arizona Republic columnist Laurie Roberts does, but she knows better. I am sure that she knows that Arpaio Campaign Manager Chad Willems is the President of Summit Consulting Group. Yet, apparently in the interest of making her point about the large number of "undecideds" in the "poll", she lends credence to the poll itself. She does not note that it was almost as if Sheriff Joe himself called people up and asked whether they would vote for him or his opponent. She also does not take note of many of the other issues with the poll that our previous post addressed. The self-described "largest progressive group of veterans" is plunking down another (at least) $117,000 to attack Rep. Jeff Flake's (R-CD6) previous votes against the G.I. Bill and other veterans-related legislation. The ad features a Chandler veteran (Steven Lopez) speaking to the camera and focuses solely on Flake's votes, even though Democratic nominee Richard Carmona is himself a veteran. HANGING CHAD: Arpaio Touts New Poll...Done By His Campaign Manager! The news release from Maricopa County Sheriff Joe Arpaio's campaign screams "Sheriff Arpaio Has Commanding Lead for Re-Election". It cites two polls. The most recent - but, still conducted just before his ad accusing his Democratic opponent Paul Penzone of "hitting a woman" (see, Fact Check) hit the airwaves - was conducted by Summit Consulting Group ("Summit"). The President of Summit is Chad Willems. The very same Chad Willems who is Arpaio's Campaign Manager. So much for the appearance of an impartial poll. The other poll was conducted by Public Opinion Strategies (which goes by its initials) is an exclusively-Republican outfit. Beautifully, Willems quotes himself in the news release... as campaign manager. But, not as pollster. Well-known newsman Al Hunt has a blog post on the International Herald Tribune (the global edition of the New York Times, according to its masthead) today, noting that Congressional campaigns are getting "positively negative." As Exhibit 1, he cites the Arizona Senatorial race between Rep. Jeff Flake (R-AZ) and former U.S. Surgeon General (and Democratic nominee) Richard Carmona, and the Flake ad airing Christine Beato allegations that Carmona had pounded on her door late at night. He adds the Florida Connie Mack-Bill Nelson battle, as well as citing other senatorial campaigns in Wisconsin, Indiana and Connecticut. Yesterday was the third time in the past week that Rep. Jeff Flake and Richard Carmona sat down together for a discussion/debate. (Arizona Republic editorial board, KAET were the first two.) The discussion was predictably testy. Perhaps the Wall Street Journal editorial writers were not watching the Arizona Senatorial primary as closely as others, but they cite Rep. Jeff Flake's recent actions and statements as evidence of "Flake's Flip Out." Their evidence? Two items: retreating from his Grover Norquist/Americans For Tax Reform no-tax pledge, and attacking Democratic nominee Richard Carmona's character with the Christine Beato allegations ad. It notes that candidates usually (as of late) allow outside groups to run these types of character-impugning charges, and wonders whether Flake thinks it is "merely payback." The conclusion hits hard, even as it tries to soften the blow with a bit of its more-customary praise: "As Paul Ryan noted in last week's vice-presidential debate, "If you don't have a good record to run on, paint your opponent as someone people should run from. Make a big election about small ideas." But Mr. Flake has both a solid record and big ideas to run on, so why isn't he?" A NEW CHAPTER! Gov. Brewer's JanPAC Jumps Into Campaign! After raising more than one-quarter of a million dollars, Arizona Governor Jan Brewer's SuperPAC is finally spending a bit of it on campaigning. The eponymously-named Jan PAC, Brewer's own SuperPAC, spent $23,256.74 on Friday for a mail piece attacking former State Senator Kyrsten Sinema as she battles Vernon Parker for Arizona's new Congressional seat (CD9). The Governor - and, her PAC - received much attention for the amount that JanPAC had raised, and how much was actually spent on buying copies of her book Scorpons For Breakfast, from Amazon (which helps keep up its rankings). So, this first campaign-related expenditure is noteworthy. Also noteworthy (although it has not received much attention), is that - while they have the financial means - the Governor and her family have NOT contributed to JanPAC. The onslaught of campaign advertising - the slew of spots - comes as early ballots are finding their way to mailboxes across the state. Of course, due to the competitive nature of several of the races - and the national attention they are receiving - we will likely continue to see this level (frequency) of messages. And, they will probably continue to be at this level (negativity) or below. Thanks to Diana B. 's and a-friend-who-wishes-not-to-be-named, we have been able to compile quite a lengthy list of ads that have been flooding Phoenix airwaves (need some Tucson contributors!) over the past 36 hours. 3: --Jonathan Paton ad for CD1, contrast. 3: --Democratic Congressional Campaign Committee ("DCCC") ad attacking Paton. 3: --Club For Growth ad asking how well do you know Carmona. 3: --DCCC ad attacking Vernon Parker in CD9. 3: --No New Taxes On 204 says it is a permanent tax increase. 3: --DSCC spot attacks Flake by superimposing him on Arizona canyon faces with previous votes. 3: --Carmona ad emphasizing seniors issues. 2: --Maricopa County Sheriff Joe Arpaio positive message with wife Ava. 2: --National Republican Congressional Committee ("NRCC") message attacking Kyrsten Sinema's comments about Scottsdale stay-at-home mom, CD9. 2: --DCCC says Paton is no friend of seniors. 2: --GOP-philic American Future Fund ("AFF") attacks Kirkpatrick. 2: --Sinema ad focusing on children and women's issues; she stands among them. 2: --Yes On 204: Quality Education For Arizona features teachers extolling sales tax. 1: --NRCC tells Ann Kirkpatrick (CD1) that the party is over. 1: --Barack Obama says that Mitt Romney is after Big Bird (supposed to be humorous). 1: --Dem-philic House Majority PAC goes after Vernon Parker. 1: --Arpaio levels domestic violence allegations (watch ad, read Fact Check). 1: --Flake ad featuring Carmona's supervisor while he was U.S. Surgeon General. 1: --Kirkpatrick spot addressing SuperPAC ads attacking her. It has been another big (spending) day in Independent Expenditure ("IE") monies flowing (mostly) into Arizona. Under $1Million, though just barely. We'll recap here, and try to provide more detail in our "As Seen On TV" post. -- The Democratic-philic House Majority PAC doubled down on its advertising against GOP nominee Martha McSally in CD2, spending $6,761.39 to produce a negative ad and $142,684.97 to air it. That pushed them over the $300,000 mark in that race. --Conservative group Freedomworks spent $35,000 on "Voter ID" to support Rep. Jeff Flake in the Senate race. They have put boots on the ground in Arizona and have now spent over $611,000 in that race. --The DCCC ("Democratic Congressional Campaign Committee") spent $11,150 to produce another negative ad against GOP nominee Vernon Parker in CD9. They have put $684,000 into that contest. --The Republican-philic Club For Growth spent more than a quarter of a million dollars (approx. $254,000) on mailers and e-mailers to support their long-time fave Jeff Flake. --The Democratic Senatorial Campaign Committee ("DSCC") threw down another $454,243 on its ad putting Jeff Flake on the sides of rocks (very unlike Mt. Rushmore). The DSCC is approaching $1 Million in Arizona ($959,000). Maricopa County Sheriff Joe Arpaio today began airing a tough new ad against his Democratic opponent Paul Penzone. Together with anti-Arpaio ads that have begun to air sporadically, it is sure to kick this campaign into a new, tougher phase. The new ad raises the domestic violence incident that occurred between Penzone and his then-estranged (now, divorced) wife. The police report includes the he-said, she-said allegations. She said that he pushed her (which he denies), and he says that she smacked him with their child's hockey stick (which she said may have happened). The new ad takes the she said and runs with it, and adds a few details that the police report did not include. It states that it happened in front of their then 10-year old, and the visual shows a much more extreme example of domestic violence. Arpaio's campaign sent out to media a copy of the police report, the wife's application for an order of protection (which was quashed, along with husband's), and a statement. We will publish those shortly. SURPRISE: National Right To Life OPPOSES Vernon Parker In CD9! Monitoring the FEC (Federal Election Commission) can provide a little surprise here and there. Partly it is because of the forms that organizations need to complete and file electronically, they can be confusing. Certainly, that was a simple coding error, either at the NRTL PAC or at the FEC. But, there is no chance that that organization is telling its members to support Democratic nominee Kyrsten Sinema. Tonight's debate between the candidates seeking to replace Sen. Jon Kyl (R-AZ) in the U.S. Senate will be broadcast live on both Channel 8 (Phoenix) and C-Span. The hour-long conversation will feature the Libertarian candidate, Marc Victor, along with the better-known Democratic and Republican nominees, Dr. Richard Carmona and Rep. Jeff Flake (respectively). C-Span is showing the Massachusetts Senatorial debate between Scott Brown (R) and Elizabeth Warren (D) as the lead-in. On Friday, the baseball playoffs started. We all know how baseball keeps statistics on everything, and we know how rare a triple play is (three outs achieved in one play). In fact, there has only been one in Arizona since the Diamondbacks started play in 1998. On Friday, there was a rare triple play in Arizona political advertising history, although we do not know how rare because statistics are not kept as fastidiously. However, having been involved with campaigns and the media for too long (long before SuperPACs geometrically increased the number of negative ads), I can guess that this may be a first. Just before Jakob Dylan and The Wallflowers rocked David Letterman's show, KPHO (Ch.5 in Phoenix, CBS) had a local commercial break. After one anti-Kyrsten Sinema ad, there were three ads in a row from three different groups attacking the Democratic U.S. Senate nominee Richard Carmona! The outside money pouring into Arizona is hitting flood levels as the voter registration deadline hits and early ballots will be going out soon. Arizona's Politics will try to keep an up-to-date register of the IE (Independent Expenditure) monies. 1) The Communications Workers of America's PAC bought $150,150 ($4,549 to produce) of ad time to attack GOP candidate for CD9 Vernon Parker. 2) The DCCC (Democratic Congressional Campaign Committee) went big opposing Parker and CD1 candidate Jonathan Paton. They bought ad time totaling $211,343.58 for the former and $212, 323.50 for the former. 3) The NRCC (National Republican Congressional Committee) spent just $30,000 on media opposing CD9 Democratic candidate Kyrsten Sinema, although they say that brings their total to over $700,000. 4) Women Vote! paid $15,815.52 for a mailer against Paton. 5) The NRSC (National Republican Senatorial Committee) finally filed its ad (which has been running for several days) against Richard Carmona. They have paid $638,753.08 for it. There must have been some reaction, because the Associated Press felt it necessary to make a "caption addition" to clarify. Further, the 2nd shot provides further clarification. Here's the link to the AP's "caption addition"! Today was a big big-money filing day at the FEC (Federal Election Commission), and Arizona's tight Senate race received more than its share of attention. We already detailed the half-million dollar ad buys by the Club for Growth and the Democratic Senatorial Campaign Committee; now we end the day with a $261,000 ad buy from the Democrat-philic SuperPAC "Majority PAC". The expenditure brings its total spending on the advertisement - attacking Rep. Jeff Flake (R-CD6) for his votes against a GI Bill and job training for veterans - to more than $400,000 ($405,036.02, to be exact). WATCH, FOLLOWING MONEY IN ARIZONA'S POLITICS: DSCC Drops Half-Million On Ad Painting Jeff Flake As "Too Extreme For Arizona Women"
The Democratic Senatorial Campaign Committee filed with the FEC this afternoon that it has spent more than a half-million dollars on an ad attacking Rep. Jeff Flake's (R-CD6) record on women's issues, and urging women to vote for Democratic nominee Richard Carmona. The production and advertising costs come to $505,682, almost as much as the conservative Club for Growth just spent on an ad attacking Carmona. Just as we were beginning to wonder why the Club For Growth had not yet jumped into the general election battle for Arizona's seat in the U.S. Senate, the conservative powerhouse jumps in with both feet, with a $530,000 television ad buy attacking Democratic nominee Richard Carmona. CFG poured more than $1.6 Million into Rep. Jeff Flake's (R-CD6) Senatorial primary battle against self-funded Wil Cardon, and Arizona's Politics has detailed the close ties between the organization and Flake before. Now that polls are demonstrating how tight the general election contest has become, CFG is stepping up again. A quick check of FCC reports filed by two Phoenix TV stations (which have been especially good about filing their reports quickly) does not show the ad buy yet, but CFG has filed today with the FEC that the money was expended on Wednesday. WATCH: McCain Primetime 2 Nights In a Row, Steps Up Rhetoric On Obama and Susan Rice: "Probably One Of The Worst Things I've Observed In My Entire Life"
Arizona Senator John McCain (R-AZ) completes (t)his interview tour of the three major cable news networks tonight, when he sits down with CNN's highest profile interviewer Piers Morgan. In a preview released by CNN this afternoon, he rips into the Obama Administration and Susan Rice (U.S.' Ambassador to the U.N.) for maintaining that the attack in Libya that took the lives of Ambassador Chris Stevens and three other Americans may have grown out of a demonstration of an anti-Muslim YouTube video, instead of a planned terrorist attack. McCain calls Rice's comments on the September 16 Sunday morning news shows "Probably one of the worst things I've observed in my entire life." The rest of his video airs tonight at 6pm (Arizona Time) (and will be repeated later in the evening). Here is a video of Susan Rice's comments on CBS' Face the Nation program on September 16. She notes that an investigation had begun, and leaves open the possibility that the evidence might show that it was more than spontaneous. Below the jump, the transcript of that interview is laid out. Very interestingly, the very next guest on that Face the Nation - in the same chair - was John McCain - he probably saw and/or spoke with Rice during the commercial break. However, when repeatedly given the opportunity to criticize Rice, he declined to mention her by name and broke off most of his criticisms of the Administration. He only repeated his complaints that the Obama Administration has made the U.S. the "weak horse" and has "disengaged." Tonight's interview will complete his two-day tour of major programs on the three cable news/political networks. Yesterday, he hit "Morning Joe" on MSNBC, where "he warned Romney and the Republicans to "not underestimate President Obama" and attributed his debate performance to "rust". Welllll, since we are in debate mode, we could lead this by saying "Well, there you go again!" 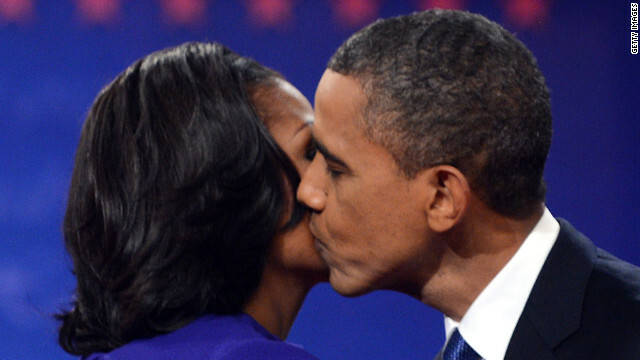 President Obama led off last night's debate by wishing his wife, Michelle, a Happy Anniversary. Both he and GOP nominee Mitt Romney made little jokes about celebrating it at a debate. However, some Obama opponents are questioning whether the President has lied to the American people. (They would add the word "again".) They have uncovered cites showing that the 20th anniversary will not take place until October 18, meaning that he made a cynical and dishonest play for good feeling at the debate. If you can read the initial post, he notes that the source is Obama's memoir, and thanks a California woman for pointing it out. I have not yet been able to verify that source, but did find that biography.com does use the October 18 date. The Facebook discussion references that Wikipedia mysteriously pulled the wedding date off of its site, but we were able to find that the Michelle Obama article still lists the October 3 date as being their anniversary, and the history page does not show any removals. Additionally, the ever-authoritative People Magazine website ran an article yesterday on that day's anniversary. Fortunately, telling the truth about your wedding date (or, for some unsuccesful candidates, "wedding dates") is not a constitutional prerequisite for being President; otherwise, we would be reporting on a hastily-called Sheriff Arpaio news conference this afternoon. We received some interesting e-mails this morning in response to our reporting (and our inquiries) on the just-released Public Policy Polling of Arizona voters. We have updated the article on the poll numbers of the Arizona Obama-Romney (and not Obama-Romney-Johnson) race, and the article on the high number of self-identified Republicans included in the new survey. In a nutshell, nothing nefarious in PPP's using numbers from a question eliminating the Libertarian candidate from the choices, and the large number of Republicans in the poll may be an indication of turnout and/or good feelings about the GOP. Thanks to Tom Jensen of PPP and Paul Bentz of High Ground. The new Public Policy Polling ("PPP") Arizona poll might help disprove the recent (national) Republican meme that mainstream polling outfits are overstating President Obama's support because they are under-sampling Republicans. Or, it might indicate that the GOP teeth-gnashing is having an effect on (some) pollsters. Current registration numbers show that 36% of Arizona voters are registered as Republicans, 30% as Democrats and 33% as something else. Yet, the new PPP poll has a pool consisting of 46% self-identified "R's", 29% "D's", and 25% "I's/others". of reason in its sampling, but it emulates the 2010 "tea party" turn out - not the 2008 and 2004 turnout." PPP confirmed to Arizona's Politics that "we do not weight our polls for party." As PPP does not do that, it is interesting that some 10% of the random pool would seem to identify as Republicans even though they may be registered differently. That is outside the 4% margin of error, and would seem to indicate that Arizonans are - currently - even more GOP-philic than the registration figures indicate. The trend may be in favor of Democratic candidate Richard Carmona for Arizona's open U.S. Senate seat. He leads Rep. Jeff Flake (R-CD6) by 45%-45%, well within the 4% margin of error. Public Policy Polling (PPP), a national company said to lean slightly Democratic, just concluded its most recent poll of Arizona voters. Its previous polling on the race was only three weeks ago, and it had shown Flake up 44%-43%. That 3-point swing could constitute a "trend", or it could simply be because of the different pool sampled in each of the two polls. Here is a link to the questions asked and numbers received, so far. PPP will likely release additional Arizona polling information over the next couple of days. WATCH: John McCain Makes Appearance At Nationals' Game, Bemoans "Vast Left Wing Conspiracy By the Commie Pinko Libs"; TR Still Loses! Arizona Sen. John McCain (R-AZ) has been an Arizona Diamondbacks' fan and regular special guest since the team came to town. With the Diamondbacks out of the playoffs and the Washington (DC) Nationals winning the 1st ever Division title for the nation's capital, it was perhaps inevitable that he would pop up at Nations Park. But, to cut a video to be shown on the big screen at the Nationals' game? That hurts. The Nationals have a nightly "race" for four big-headed ex-Presidents. (The Diamondbacks have similar in-game entertainment, featuring four well-known ex-Diamondbacks. By the way, could you imagine if we used four ex-Arizona Governors...?) The running joke in D.C. is that President Theodore Roosevelt has never been "able" to win the race. There are still two home games left for the Diamondbacks. Will a 2nd McCain sobering-yet-rousing pep talk be in the cards?